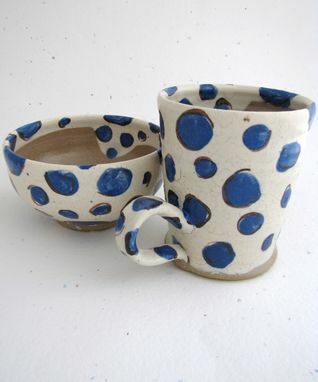 These hand thrown bowls and mugs are made from a local stoneware clay and are hand decorated with all food safe materials. They are thrown thicker than my usual work to be stronger and are dishwasher, microwave and food safe. These can be custom made in groups and plates can be added if wanted, This set pictured was for bowl and mugs only. Interior is finished with a clear liner glaze. Prices for work vary on quantity wanted. Dimensions: Mug holds approx.16-20 ounces and bowl holds around 2 cups. Sizes can vary as is the nature of hand made ware.